SAMSUNG Galaxy Watch (42mm, 46mm) unveiled with Tizen Wearable OS 4.0 and LTE. 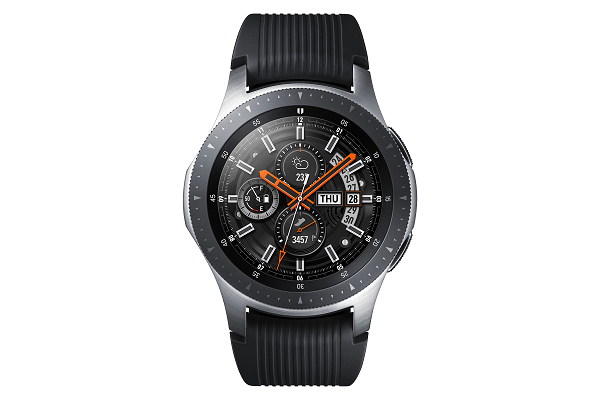 Samsung Electronics today introduced the new Galaxy Watch with long-lasting battery life, LTE connectivity, wellness and sleep monitoring capabilities. It comes with style options including three new watch faces in Silver, Midnight Black and Rose Gold, and new customizable watch band colors. Galaxy Watch caters to more sizes and styles with a silver, 46mm version and 42mm option in black or rose gold. The 46mm Silver version of Galaxy Watch features a 1.3-inch Circular Super AMOLED display, while the 42mm models (Midnight Black & Rose Gold) come with a 1.2-inch screen. Galaxy Watch comes with Samsung's its trademark circular, rotating bezel while embracing the digital look with Always On Display. For the first time, Galaxy Watch features analog watch ticks and hourly chimes, and a depth effect that casts shadows defining every detail on the watch face for a traditional look and feel. In addition, Galaxy Watch's certified military-level durability with Corning Gorilla Glass DX+ and industry-leading water resistance with a 5 ATM rating allows for long-lasting use, no matter the environment. Both the models are powered by 1.15GHz Exynos 9110 dual-core processor. The Galaxy Watch is backed by a 1.5GB of RAM and 4GB of internal memory for the LTE version, while the Bluetooth option features 768MB RAM and 4GB of internal memory. The 46mm model is backed by a 472mAh battery, while the 42mm model features 270mAh battery. The Galaxy Watch smartwatch runs on Tizen bases Wearable OS 4.0. It comes with 3G/LTE, Bluetooth 4.2, Wi-Fi b/g/n, NFC, A-GPS/Glonass, Accelerometer, Gyro, Barometer, HRM and Ambient Light. Galaxy Watch also helps users achieve other health and wellness goals, including fitness. Galaxy Watch adds 21 new indoor exercises, tracking a total of 39 workouts that allow consumers to customize and change up their routines. Because balanced nutrition is as important as exercise, Galaxy Watch makes it easier than ever with intuitive calorie tracking and personalized alerts. In addition, users can stay on track of their meals using Bixby Vision on their Galaxy device. To take a photo of each meal and instantly log nutritional information in Samsung Health and on Galaxy Watch for better calorie management. Easily access and control devices on Galaxy Watch with SmartThings - all at the touch of a wrist - from turning on the lights and TV in the morning to adjusting the temperature before bed. Samsung keeps Galaxy Watch user's information secure with Samsung Knox and users can also easily unlock PCs or tablets using Samsung Flow.